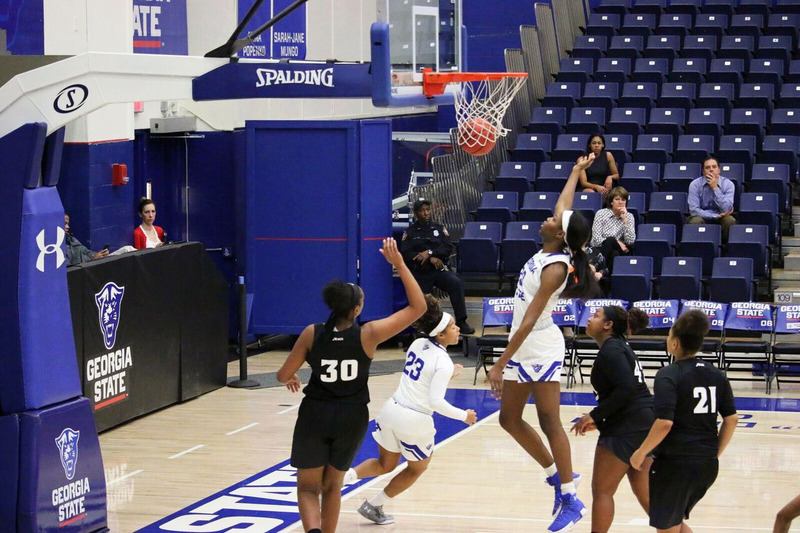 Once the fall semester ended, most students got the chance to go home, relax and unwind after long semester in the classroom, but members of the Georgia State women’s basketball team were not able to say the same. The Panthers were hard at work on the hardwood during the break. Unfortunately for the Panthers, they didn’t fare so well going 2-6 and dropping their first four games in Sun Belt Conference play. The Panthers lost games against Florida Atlantic, North Carolina Wilmington, South Alabama, Troy, Arkansas State and Little-Rock. The Panthers were able to win games against North Greenville and Jacksonville State. Conference play has been an issue with the team so far this season, with them struggling from the get go, losing 88-52 to South Alabama. The team played much better in their game against Troy, but unfortunately, they lost by four points due to lack of execution. “We were good offensively versus Troy, but were not able to make plays in the last couple of minutes. This will help our team as we continue in conference,” head coach Sharon Baldwin said. The last game of the break was a disappointing loss to the Arkansas State Red Wolves, 75-58. The Panthers were in the the game during the 1st quarter, even leading at one point 10-8. But after an Arkansas State timeout, the Red Wolves hit a three to take the lead, and from there, they didn’t look back. The Red Wolves led by four points after the 1st quarter, but a big run in the 2nd quarter with three pointers from Payton Tennison helped the Red Wolves push their lead to 12 at the half. The Panthers came out of the halftime break in a press, and it worked as they were able to trim the lead down to seven, but that’s the closest they would get it the rest of the game. The Panthers have struggled all season long with turnovers, and they committed 19 in the game against the Red Wolves. There were some positives to come from the break. There were several players who continue to emerge as scoring threats. Number one on that list is guard Kierra Henry. Henry has really stepped it up for the Panthers with star Jada Lewis being out due to injury. Henry has averaged 18.7 points over the past eight games, and set a new career-high with 28 points in the loss against Troy. Also, Janessa Murphy is shooting 44 percent from the three point line this season, and she also scored a career high of 25 points this season, going 7-9 from behind the arc. One point of emphasis for the team going forward is not only winning a game to end the losing streak and getting a conference win but winning a road game. The team is 0-7 so far this season on the road. “We played a very demanding road schedule and started conference against two strong opponents. We definitely need to get better and take care of our home court and steal some on the road,” Baldwin said. The Panthers will have two chances to get a road win as their next games come against Appalachian State and Coastal Carolina.